Do elephants have lips? if so then this is through them and into the depths! I love it. Elephants are so very big, I’m not sure I’d stick my hand in there. This one was a cute baby! I believe he is saying AWH! Nice choice for challenge. I love the look in the elephants eye… so expressive… is that fear? shock? wonder? great photo. He does not seem to like that 🙂 Great shot! That is an interesting shot, Gilly. The poor elephant looks terrified, though. I don’t like dentists either (for the fact someone is poking around in my mouth, and I can’t see what they are doing to me… probably just as well). 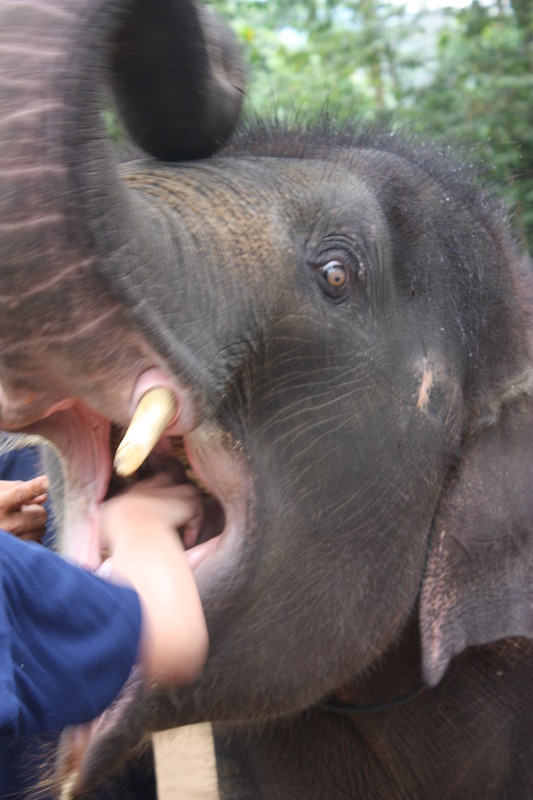 i wonder what that dude is doing rummaging around in the elephant’s mouth? Great shot, but I would be nervous to put my hand there! Aww Gilly you have made me feel all gooey…so sweet. I wouldn’t do that for money. … well.. how much could i get? Love it! Elephants are my favourite animals! Great shot Gilly Gee! I love baby elephants! trust my dog, but this?! Hahaha I would agree if it was my hand but I had a firm hold onto the camera! into the deepest depths, funny! a unique click – and a good question, too. I’m always amazed at people who put their hands and arms and heads inside an elephant’s mouth or an alligator or a tiger. Great shot. Wonder what that eye is telling us? To be fair it was a hungry baby and very cute. I have photos of friends sat on crocodiles – taken from a distance because I wouldn’t go near one of those beasties! that’s neat, a baby elephant!